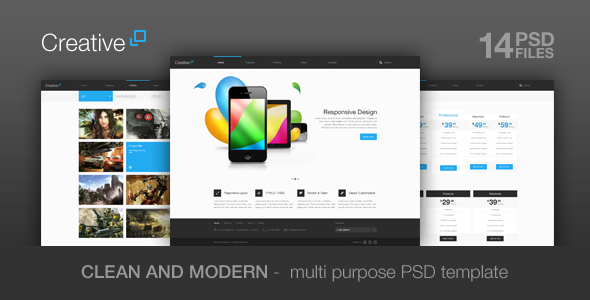 Creative – Multi Purpose PSD Theme Created by ClaPat. This templates have specific characteristics, namely: Creative has features such as High Resolution: Yes, Layered: Yes, Minimum Adobe CS Version: CS2 . You can use this Creative – Multi Purpose PSD Theme on Psd templates category for blue, business, clean, corporate, elegant, flexible, minimal, modern, one-page, portfolio, professional, responsive, unique, white and another uses. This a template for web business. Clean and modern with 3 type of portfolio. BONUS: One Page Template is included. Please rate it after purchase.